Last month, my little 3-year-old explorer and I had the opportunity to visit the Discovery Cube Los Angeles, an indoor wonderland of learning and imagination through interactive play and real world experiences. We took a mini tour of the play areas and exhibits starting with Nickelodeon Dora & Diego Let’s Explore! Each exhibit encourages children to role play and interact with their favorite explorers, Dora & Diego. Problem solving games, slides, obstacle courses and the look and see exhibits exercised my daughter’s mind and body. Other Nickelodeon Dora & Diego Let’s Explore! adventures we explored included my daughter’s favorite space station stop – The Purple Planet, Isa’s Flowery Garden, Tico’s Nutty Forest, Rainforest Maze and The Pirate Piggies’ Ship. My daughter even made a few new friends along the way in the space station and rainforest areas. The Nickelodeon Dora & Diego Let’s Explore! is tailored for visitors age five and under and will on display at Discovery Cube LA through September 18. The Discovery Cube Los Angeles has put also together a comprehensive family guide to continue your exploration with Dora & Diego at home with books to read, website resources to prepare children for preschool and more. 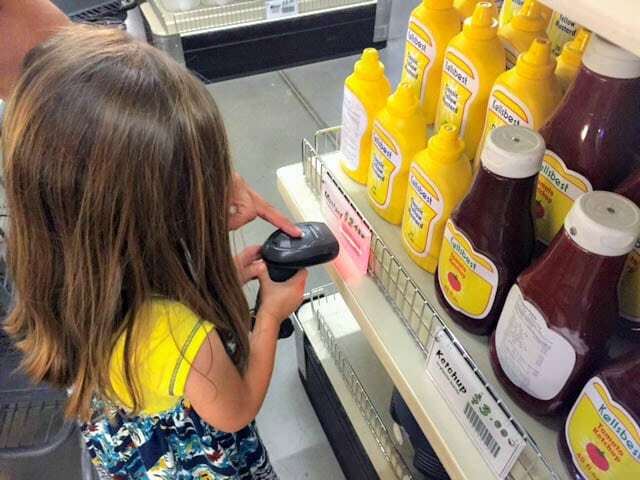 After visiting Nickelodeon Dora & Diego Let’s Explore!, my daughter and I switched roles at the Discovery Market as she took charge of the shopping list, cart and checkout process. 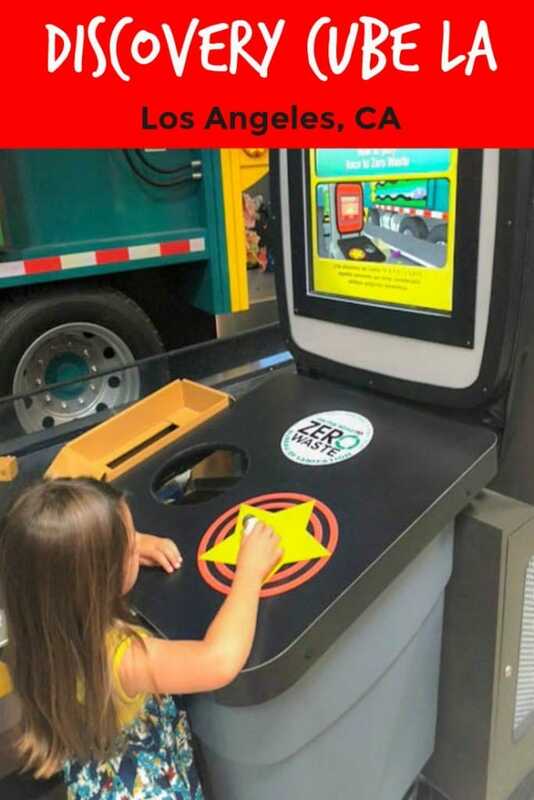 The Discovery Market is a very impressive hands-on exhibit allowing children to learn real world skills such as food selection, nutrition labels and more. 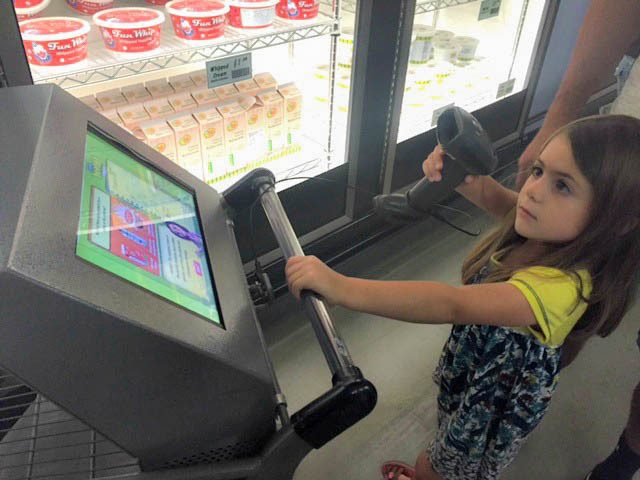 Small scale shopping carts include a game-based video that instructs tiny shoppers on what to shop for and how to purchase items from the list. This exhibit was my daughter’s favorite because she was “being mommy” and shopping. 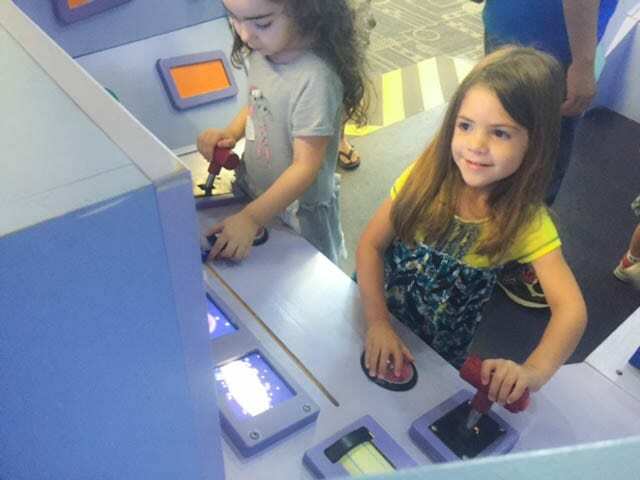 The Discovery Cube LA has done a phenomenal job at bringing real world experiences into playful exhibits that come to life for our little ones. At home, I spend a lot of time teaching my daughter about recycling, home composting and caring for our environment. 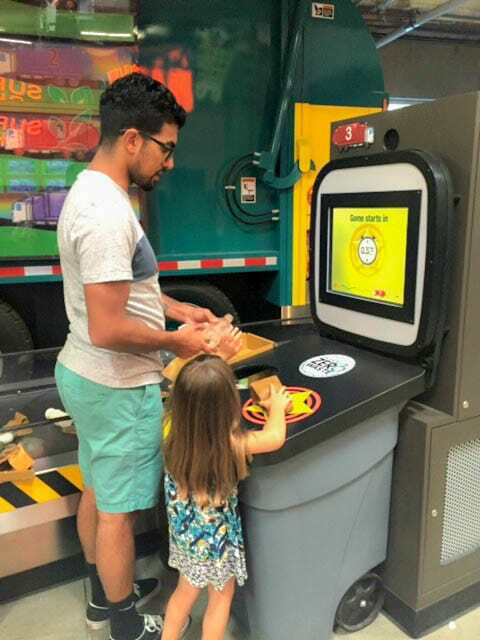 The Race to Zero Waste exhibit at the Discovery Cube Los Angeles offers a fun, fast-pasted lesson in keeping common household items from landfills. I’m not sure if my daughter or her dad had more fun racing against other players to sort items from the conveyor belts to the correct method of waste disposal! Learn and explore your own backyard with mini exhibits explaining wind and water patterns and natural habits of Southern California. Feel the warm rush of the Santa Ana winds or canoe down the L.A. River before gearing up for the popular self-lifting pulley system challenge. Before exploring the Cube take a few minutes with the floor map and exhibit guide to plot out your course. Knowing your child’s interests and abilities ahead of time will help you navigate the Cube’s many areas to tailor the visit accordingly. 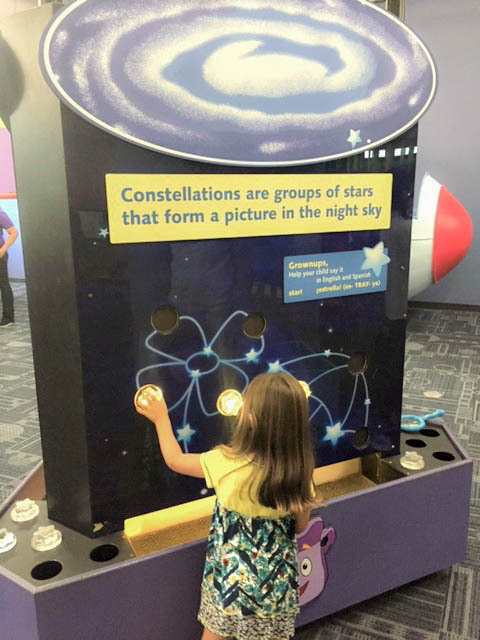 There is so much to see at Discovery Cube LA that I recommend planning multiple visits to let your explorers experience the full benefits of interactive learning play. The Discovery Cube LA offers grade-specific field trips to the Cube all year round for groups of 15-200 students. Their large-scale exhibits, interactive programs and live science demonstrations all align with California Science Content Standards. Field trips start as low as $5.00 per student and include an activity booklet and a free “come again” pass for children ages 3-17. Reservations must be made in advance. Now enter to win 4 tickets to visit the Discovery Cube LA with your family! The Discovery Cube Los Angeles is open daily from 10:00 am – 5:00 pm year round except for Thanksgiving Day and Christmas Day. Tickets are $16.95 for adults, $12.95 for seniors (62+) and children (ages 3-14). Admission for Museum members and children 2 and under is FREE. The Discovery Cube LA is located at 11800 Foothill Boulevard, Los Angeles, CA 91342. I used to love to go on science related field trips when I was younger and now I can’t wait to take my own kids on field trips! This looks so fun!! Thanks for the chance for free family fun! My daughter is still talking about her visit. I love that the Discovery Cube brings real life experience to our children through interactive play! My favorite science experiment as a kid was the egg drop!